Palmer’s depictions of Arkansas’ Champion Trees, including Southern Magnolia, Chinkapin Oak and Shortleaf Pine, are individual portrayals that reflect not only the façade of the individual tree, but often the history of the trees’ owners and the variety’s historic significance as well. Linda Williams Palmer is a featured speaker at the 2015 Arkansas Flower and Garden Show. 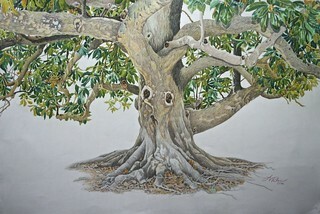 She will deliver a presentation about her colored pencil drawings of Champion Trees throughout Arkansas. Champion Trees are those measured and recorded to be the largest reported specimen of each tree variety in Arkansas. The list, maintained by the Arkansas Forestry Commission, has about 130 entries and is updated every five years. Since she began her Champion Tree quest in 2007, Palmer has photographed some 60 trees on the list, and completed pencil drawings of 23 of them. Because her subjects are living things with limited time on earth, the drawings also function as historical documents of sorts. This February, Palmer will bring her story of documenting some of the most extraordinary trees in Arkansas to the 2015 Arkansas Flower and Garden Show, Feb. 20-22. Palmer and her colored pencil works are also the subject of the documentary “Champion Trees.” The film, produced by the Arkansas Educational Television Network, won two Emmys, as well as a CINDY gold award and a Platinum Best in Show in the Documentary-Cultural category of the Aurora Awards Spring 2014 competition. This drawing of a Southern Magnolia is one of more than 20 Champion Trees Palmer has created from photographs. Palmer said after photographing a tree, she will examine the photographs — perhaps 40 or 50 of them — while deciding how to depict the subject. Krista Quinn, executive director of the Arkansas Flower and Garden Show, said she and the show’s board of directors sought out Palmer as a presenter for 2015 because of her unique depictions of extraordinary trees. Palmer said she lacked any deep horticultural understanding of trees when she began the Champion Trees series, but as the project has progressed for more than six years, she has incorporated a growing base of knowledge into her artwork. 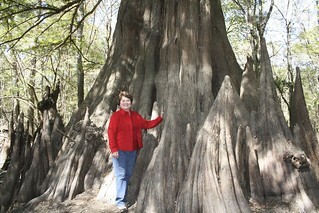 Palmer said she has also written about her experiences with many of the trees she has drawn — the history of the tree, the landowners involved, and the occasional adventure involved in even finding a tree — and is considering self-publishing a book about the works, which could be in print before the Arkansas Flower and Garden Show in February. Dolores Justus, a Hot Springs gallery owner who has known Palmer for more than a decade, said Palmer’s style has not changed significantly over the years, but her productivity has become much more intense. “As far as her execution, she’s always been wonderful with colored pencil,” Justus said. “There are some pieces that predate all the Champion Tree work that are just as strong as what she’s doing now. But she’s just done so much more, and this series has really struck a chord with so many people throughout the state. Readers planning to attend the 2015 Arkansas Flower and Garden Show should visit www.argardenshow.org for a full list of speakers and vendors.